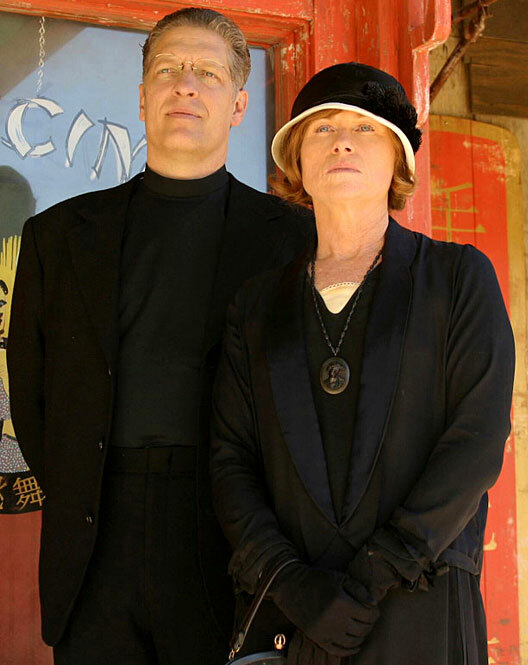 I watched the first season of Carnivàle (2003) a year or so ago, and last night I finished watching the second season (2005)… which also turned out to be its final outing, after the show was cancelled by HBO a full four years short of the epic run that its creators had initially envisioned. It’s not that difficult to understand why the series was canned, with its lethargic pacing and dense mythology discouraging casual viewers, while its 1930s “Dust Bowl” setting, apocalyptic FX, and travelling-fun-fair premise ate up the budget. I can’t say I was ever bored while watching this show… but I was never particularly spellbound or electrified either… so, overall, I think I’d call it a wash. Still, the thing that’s really bugging me in retrospect is how the series was pitched as an epoch-defining battle between “Good and Evil”, when to my eyes it was more like a clash between “Evil and Awful”. While there were plenty villains doing despicable things with extreme malice and demonic glee, there wasn’t a single hero or heroine you could identify as unconditionally kind and compassionate and courageous… or any other attribute that might qualify as “Good” on the Dungeons & Dragons alignment spectrum. Even the main protagonist’s “healing power” required him to draw an equivalent (or more-often disproportionate) amount of life force out of the nearby people and animals, in order for it to work… and if we take the philosophical position that all life is equally precious, that means he was only ever redistributing pain and death, rather than alleviating them… which, by definition, is a “Neutral” act, rather than a “Good” one. All that being said, there were several great performances to enjoy here… particularly Clancy Brown’s show-stealing turn as ‘Brother Justin Crowe’, whose voice is so powerful and compelling, you can easily believe that crowds would flock to follow him even without the subliminal messages that seeped into his radio broadcasts! And Amy Madigan proved an excellent scene-partner for him, playing Justin’s alternately disapproving/supportive/conspiratorial sister ‘Iris’. 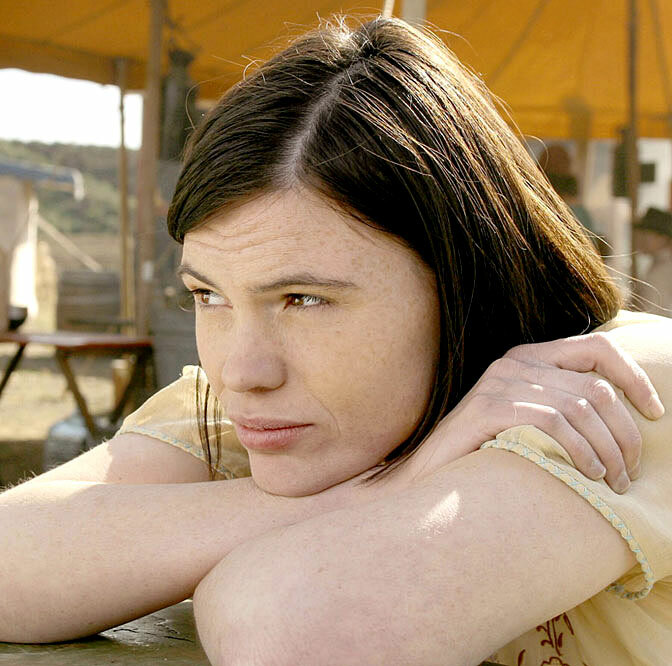 Clea Duvall gave the show a posthumous shout-out during an interview in 2011, stating that it was the best job she’d ever had, because it gave her an opportunity “to build the character and have her change and evolve.” No doubt she was especially gutted by the show’s premature cancellation, as errant-fortune-teller ‘Sofie’ was being primed to play a far more prominent and challenging role in the ongoing saga… and I also regret the fact that we’ll never get to see her explore that particular “evolution” on-screen, because Duvall really is a fantastic actress, and definitely deserves more prominent showcase roles, dammit! This entry was posted in Rants about TV and tagged Amy Madigan, Carnivàle, Clea DuVall. Bookmark the permalink. I loved this show and was enthralled by the plot and concept. I was extremely disappointed when it ended. There was so much symbolism and so much depth to all of the characters. I would have liked to have seen how it played out as the writers intended.